Typical toys-to-life games feature figures that are little more than plastic statues that gain personality and character after being ported into a video game. 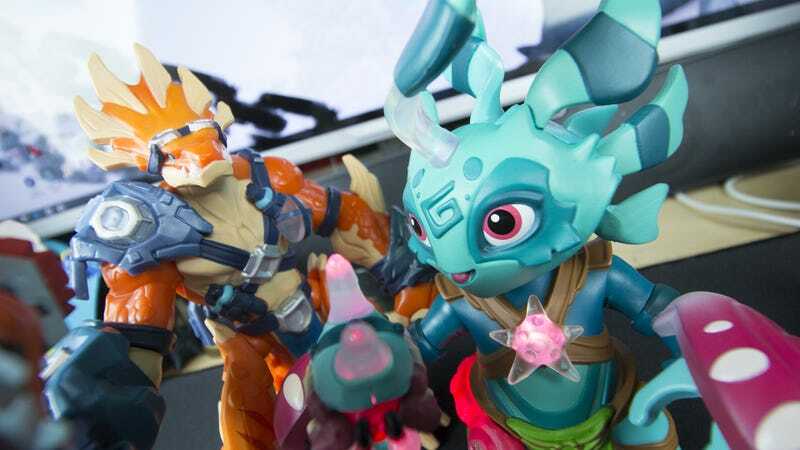 PlayFusion’s Lightseekers are gorgeous high-tech articulated action figures players can interface with a mobile game that doesn’t do them justice. When I first wrote about the video game aspect of Lightseekers back in early May, I said the sprawling Diablo-style action role-playing game was pretty good without the toys. And it is. The Lightseekers video game is a free-to-play action role-playing game for iOS and Android. Players can create a character based on the two races of launch toys and spend countless hours wandering the world completing generic quests or participating in competitive mini-games with their friends. I was also really impressed with the quality of the Lightseekers toys when I first got my hands on them during Toy Fair 2017 in New York City. They are large, bulky figures filled with personality and loaded with tiny details. When connected with the Fusion Core, basically a miniature computer that plugs into the back of the figures, the characters light up, talk and vibrate. The toys have started hitting stores, with two starting characters, Mari and Tyrax, available in $70 starter kits from Toys’R’Us. I’ve received both packs, and the figures are every bit as impressive as they were during their Toy Fair debut. I thought I might have been seeing a fancy production model, and the release toys would be of lesser quality. That’s not the case at all. These two are beautiful. The paint job is spectacular. The translucent elements light up pleasingly when the figures are attached to their high-tech computer backpacks. The voices are a little muffled, but that’s to be expected from small speakers hidden within plastic shells. Less impressive is how the toys interact with the game. These big, beautiful figures are represented in the Lightseekers game by tiny on-screen characters. You can barely make them out during combat. As you play the game with your figure connected, it lights up. Should your health start to drop, the lights on the figure will flash red. They’ll spout one-liners, or tell you when your combo is ready. A recent update added more voice lines to the characters, including situational phrases based on where they are in the game. Each starter pack comes with one weapon, which can be swapped between characters. Weapons level up independently of characters, their glow becoming brighter as they gain power. Additional weapons can be purchased for $15 apiece. Other purchasable accessories include $10 shields and $15 flight packs. The flight packs grant gives players the ability to control their characters using the toys instead of touch screen controls, which would be neat if implementation weren’t clumsy and awkward. You hold the toy like a joystick, tilting back, right, left and forward to determine the direction they’ll auto-run. A button on the Fusion Core handles attacks, replacing the game’s skill system while in flight, which basically makes the whole flying thing a lot less interesting than just playing the game normally. Outside of the main adventure, there are several mini-games players can participate in, with the option to use their figure as a controller. There’s a game where you fly about, gathering coins, or a Whack-A-Mole style joint. As with the core adventure, the touch screen controls are much easier to use in these sequences. The main role of the toys in the core adventure seems to be to provide voice and light, as well as being an interface for adding new weapons and accessories to the game. They store data. The figures can act as controllers, but not good controllers. It just doesn’t feel like these awesome articulated figures are doing enough in the game. Having played the Lightseekers game for a month before getting my hands on the toys, they don’t add much to the experience. One of the toys I purchased didn’t add anything at all. The C-Tech Cannon is part of the second wave of accessories for the game. I picked it up from my local Toys’R’ Us yesterday. I connected it to my figure, and nothing happened. I spent an hour trying to get it to work. Finally I went to the Lightseekers forums, where I discovered that wave two wasn’t supposed to be out yet, and wasn’t implemented in the game. Great! I also discovered that Lightseekers toys are linked to the players’ account upon activation, and cannot be unlinked. That means no trading figures between friends (accessories are fair game) and certainly no second-hand sales. That’s kind of rough. Still, I love Lightseekers toys. I like the game by itself just fine. The third aspect of Lightseekers, an expansive collectible card game with augmented reality features and the ability to scan the cards into the game to unlock new powers and equipment, is pretty great. In fact, I’d say the card game and the video game come together much better than the video game and the toys. There are hundreds of cards, and each can be scanned in to the game for equipment and buffs. The PlayFusion folks are constantly rolling out updates, improving both the game and how the toys work while injected into the adventure. I’m just concerned Lightseekers won’t last long enough to enjoy those changes. The Toys’R’Us employee who checked me out yesterday said it was the first time she’d seen anyone buy the toys, and they’d been in the store for weeks. The true test of Lightseekers is how the “connected play” aspect works, and between the mobile role-playing game and the figures, that’s not very good. Were these toys simple painted plastic statues, scanning them into a game and seeing them spring into action might have been enough. But the Lightseekers toys are better outside of the game than they are inside.